Odd Nerdrum (born April 8, 1944), in Sweden, is a Norwegian figurative painter. The style and themes in Nerdrum's work, based on anecdote and narrative place him in direct conflict with the abstraction and conceptual art considered acceptable in much of his native Norway. Nerdrum creates six to eight paintings per year that have been categorized as: Still life paintings of small objects like bricks, portraits and self portraits whose subjects are dressed as if from some other time and place, and large paintings, allegorical in nature that present a sense of the apocalyptic, and again reference another time. Nerdrum claims that his art should be understood as kitsch rather than art as such. "On Kitsch", a manifesto composed by Nerdrum describes the distinction he makes between kitsch and art. Nerdrum's approach to painting is based on traditional methods: mixing and grinding his own pigments, working on canvas stretched by himself or assistants rather than on pre-stretched canvas, and working from live models often himself, and in many cases members of his family. Rembrandt and Caravaggio are primary influences, but secondary influences include the masters Masaccio, Leonardo de Vinci, Michelangelo, Titian, and the less obvious influences, according to Vine and either mentioned by Nerdrum himself or other critics, that include Brueghel, Goya, Chardin, Millet, as well the even less apparent Henry Fuseli, Caspar David Friedrich, Ferdinand Hodler, Edvard Munch, Kaethe Kollwitz, Salvador Dali, Chaim Soutine and Lars Hertervig. Search for more Odd Nerdrum items on AMAZON. This slender catalogue features the most recent body of work by the important figurative artist Odd Nerdrum. The condition of man, alone in the universe, has long been Nerdrum's essential subject, and the eight new paintings detailed here continue themes repeatedly explored by this consummate representational painter, including such basic feelings and needs as love, fear, reverence and conflict, as well as the ideas of man cast against nature, society versus solitude and the limits of man's location within the universe. Featuring haunting self-portraiture and figures that float, free of gravity and disconnected in space, this volume offers a brief glimpse of Nerdrum's vision of man's position in the universe. Removed from any earthly landscape, man is not circumscribed by life on earth, but is shown in the deep space of the night sky or the endless depth of primordial waters, free to explore the boundaries of human potential. Kitsch has long been viewed as fine art's poor relation, aping its form while failing utterly to achieve its depth of meaning. In "On Kitsch" Odd Nerdrum and others discuss the meaning and value of kitsch in today's world, and its relationship to art. For the first time in this volume, English-speaking fans have the chance to read the writings of Odd Nerdrum, Norway's most famous contemporary artist, or kitch painter, as he would refer to himself. This printing of a variety of writings by Nerdrum and others includes speeches, essays, and humorous pieces such as "The Kitch Questionnaire," and "Kitch Aphorisms." This book is an opportunity to discover the thought process of one of the world's most unique and compelling artists. Essays by Jan-Erik Ebbestad Hansen, Sindre Mekjan, Odd Nerdrum, Jan-Ove Tuv and Dag Solhjell. This slender catalogue features the most recent body of work by the important figurative artist Odd Nerdrum. The condition of man, alone in the universe, has long been Nerdrum's essential subject, and the eight new paintings detailed here continue themes repeatedly explored by this consummate representational painter, including such basic feelings and needs as love, fear, reverence and conflict, as well as the ideas of man cast against nature, society versus solitude and the limits of man's location within the universe. Featuring haunting self-portraiture and figures that float, free of gravity and disconnected in space, this volume offers a brief glimpse of Nerdrum's vision of man's position in the universe. Removed from any earthly landscape, man is not circumscribed by life on earth, but is shown in the deep space of the night sky or the endless depth of primordial waters, free to explore the boundaries of human potential. --This text refers to the Paperback edition. Themes is the most comprehensive collection of Odd Nerdrums works ever published. Its 500 pages are filled with sketches, drawings and studies, along with excellent reproductions of the artists most important and most recent finished works. A wide selection of close-up details offers the tightest possible view of Nerdrums brushstrokes, which will be of particular interest to students--those who wish to learn his modern take on the Old Master style just as they would learn from the work of the Old Masters themselves. The selection is the artists own, divided into 20 chapters devoted to space, nudes, portraits and other topics, and presented chronologically within each chapter to show the development of specific motifs over the course of his career. This structure and the wide range of work present provoke new insights into the central themes in Nerdrum's work, and his treatment of them from first sketches to final canvases. Nerdrums latest works--more than 40 paintings in all, dating from the last five years--are presented here for the first time. They complete an unprecedented overview of his oeuvre, a must for everyone interested in the how and why behind one of todays most controversial and celebrated painters. With a huge cult following among figurative art lovers, outsider art fans, and students, Norwegian artist Odd Nerdrum has carved out a unique and sometimes jarring niche in the world of contemporary art. 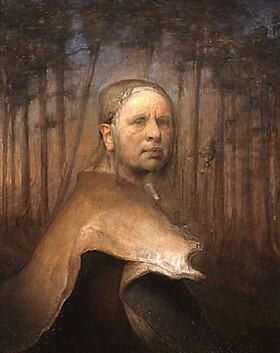 With his Old Master style and his often apocalyptic subject matter, Nerdrum rejects the tropes of Modernism in favor of an emotionalism which, when combined with his remarkable painterly talents, produces works that are not only visually arresting, but which also, by their mere viability, call into question the very foundations of contemporary art. "Odd Nerdrum: Sketches, Drawings and Paintings" brings together the recent work completed since the publication of "Storyteller and Self-Revealer" in 1998, as well as earlier work, including, for the first time, an extensive selection of drawings and sketches. At 400 pages, with over 200 color illustrations, this volume is the most comprehensive book available on the work of one of the world's most popular and idiosyncratic artists. Odd Nerdrum was born in Norway in 1944, where he still lives and works. Among the U.S. institutions that have held solo exhibitions of his work are the Museum of Contemporary Art, San Diego; the Cleveland Center for Contemporary Art; the New Orleans Museum of Art; the Museum of Contemporary Art, Chicago; and many others. His work is in major public collections worldwide, and he shows at the Forum Gallery, New York. 250 color and 150 b&w. Featuring 185 color illustrations and 50 detailed reproductions, this biographical profile explores the work of Odd Nerdrum--a modern-day artist whose painterly "Old-Master-Style" represents both a reaction against contemporary aesthetics and a radical updating of traditional narrative and religious art.